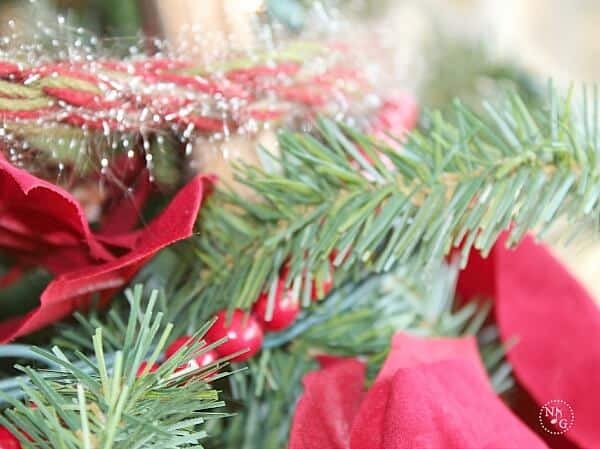 Christmas is often a time when we evaluate our budget and realize that we may have to trim the excess to make Christmas work. 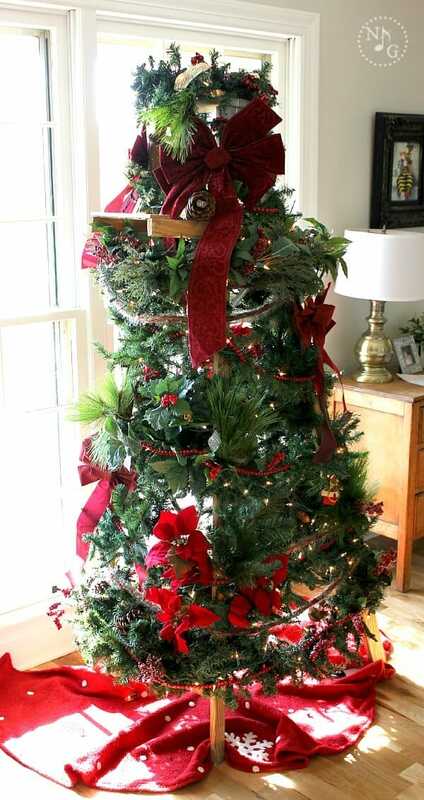 I have come up with a unique Christmas Tree idea that will help keep the presents under the tree! 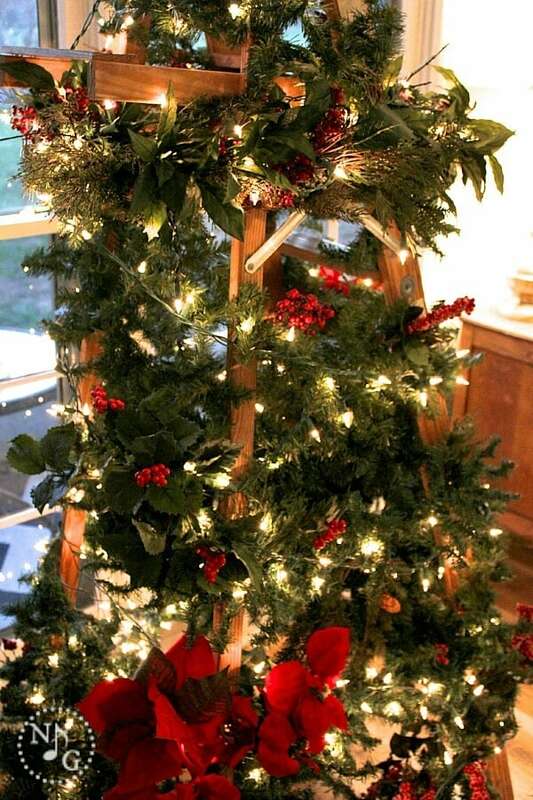 Let me show you how to make your own Christmas Tree Ladder. 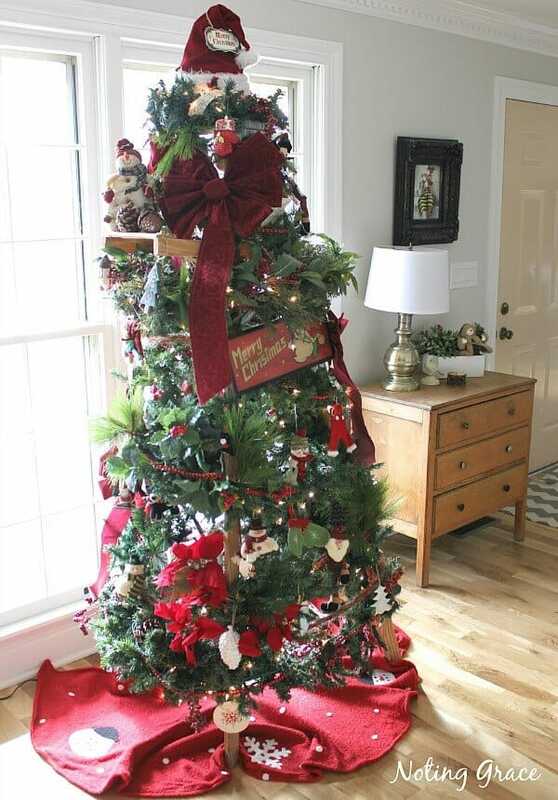 Christmas Tree costs range anywhere from $50 for a live tree and $75 and up for an artificial tree. At those prices, most of the tree are scraggly and small. We had an artificial tree that died on us. The lights no longer worked and it was more trouble reviving it each year to replace the bulbs. Last year, our Christmas budget was hit hard. What were we to do when there was no room left for the tree? 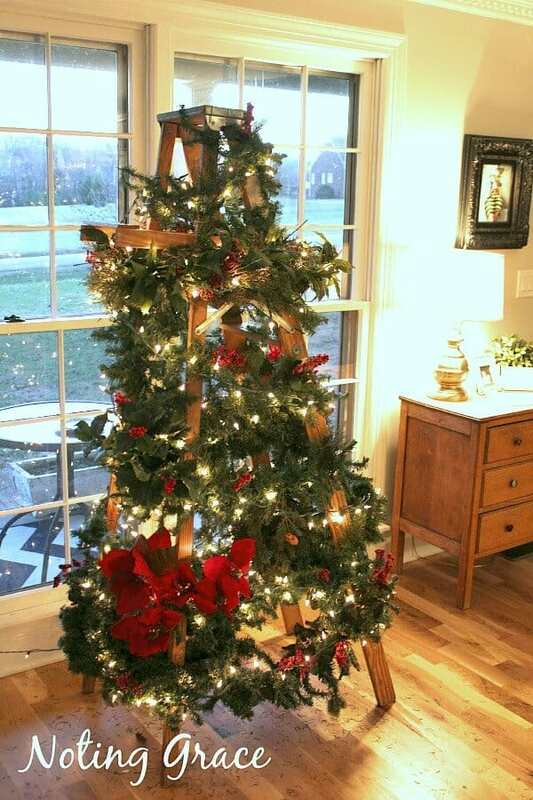 Then I came up with a great idea after seeing ladders wrapped with Christmas lights. They were beautiful, like this one from DesireEmpire. I had a bunch of left over garland and wreaths so I thought,why not amp up my ladder a notch? 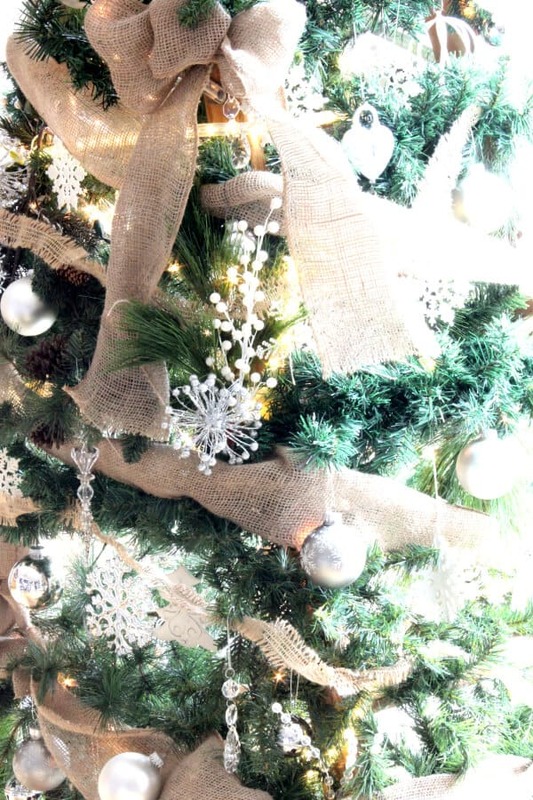 I wrapped the artificial garland and lights around the tree. 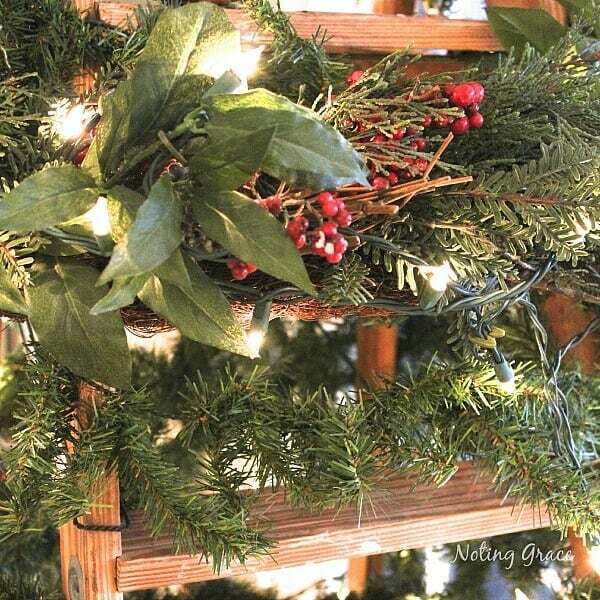 On the ladder treads, I placed the wreaths. 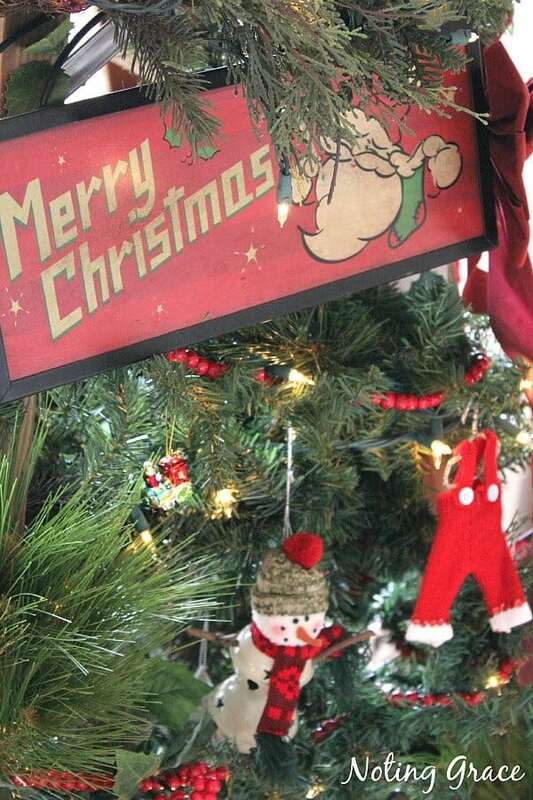 I had some extra artificial greenery and poinsettias,so I added those in the noticable gaps. Next I added my beaded and finger knit garland, and some bows and placed it where places needed filling. Here’s a link to a previous post I did on my finger knit garland. Time to decorate the tree! 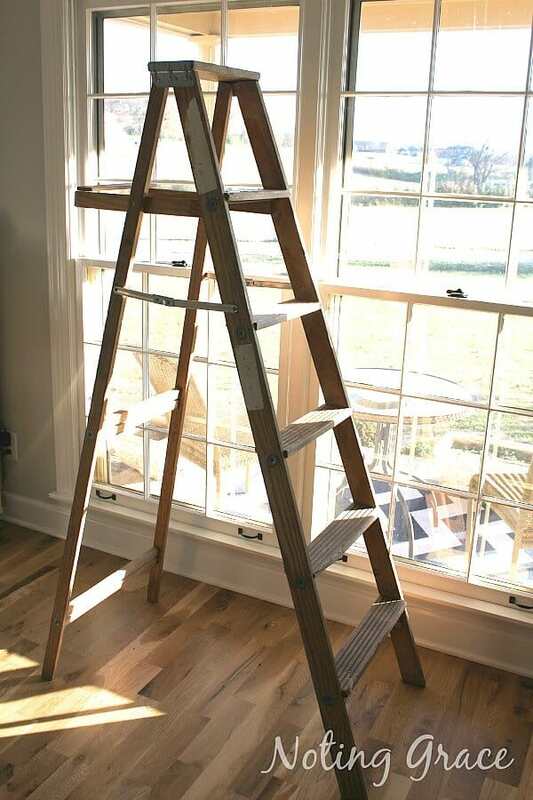 The fun thing about using a ladder as a tree is you have all these neat little niches and steps to decorate with. I had this cute sign that I hung from the ladder hinge. 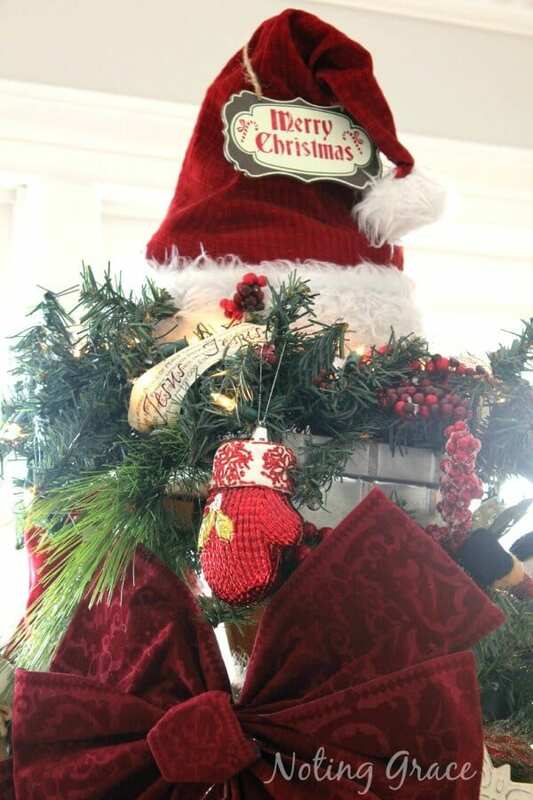 I placed a snowman on the shelf of the Christmas Tree ladder. For the topper, I used a santa hat. 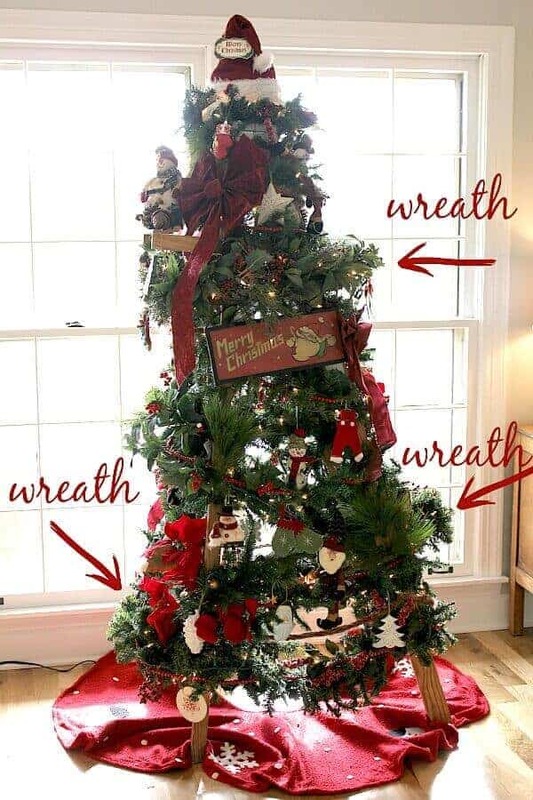 The placement of the wreaths help to shape the tree and give it a less industrial feel. This became somewhat of a tradition so I’ve included one in my decor many times! 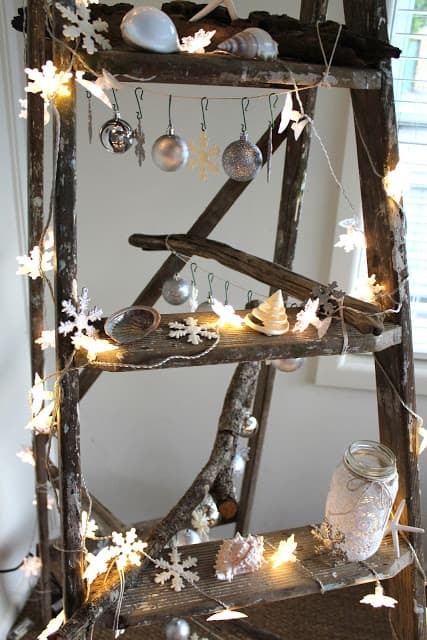 Here’s another version of a Christmas Tree Ladder – a bit more glitzy! So, what do you think? 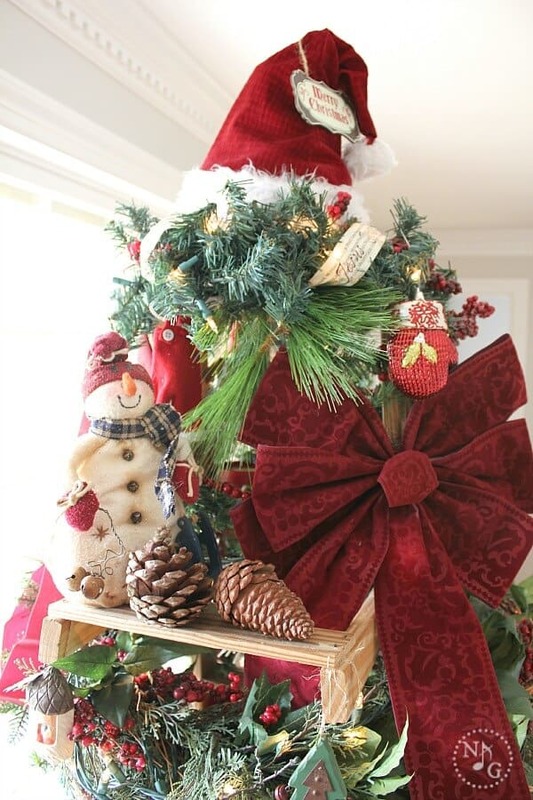 Share with me your budget friendly Christmas ideas or your unique Christmas trees. Sharing with these lovely ladies! Previous Post: « DIY Pallet Kitchen Island for less than $50! 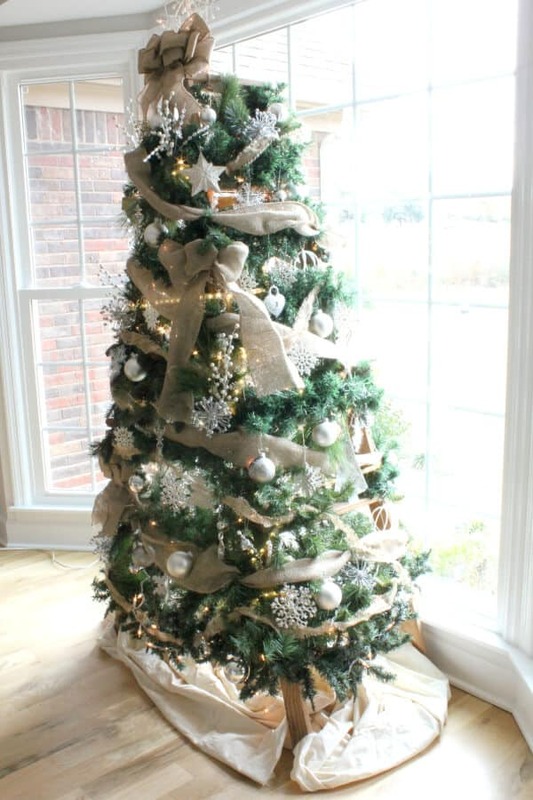 Love this idea and you sure did a great job decorating it. Thanks so much for sharing at Vintage Inspiration Party. This is so, so cute! You did such a creative job on decorating! Love it! 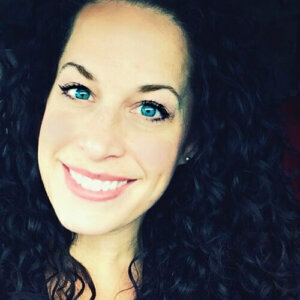 I would love if you would share this at my blog party, Celebrate It! It is all about celebrating this wonderful, everyday life we live! Very clever and it looks so pretty!